Beltane or the Royal Wedding? It was a tough choice between them for The Bad Witch's Festival of the Week. After all, Beltane - or May Day - is one of the most popular pagan festivals of the year, with all sorts of fun and games taking place to celebrate the start of summer. And the Royal Wedding, being a Church of England ceremony, is hardly pagan. However, it is a huge event that pretty much everyone in England is going to celebrate in some way, whether they are going to London tomorrow for a glimpse of Will and Kate on their big day, bedecking their homes with flags and throwing a party or just settling down in front of the telly with a cuppa at around 11am. Looking at it that way, The Royal Wedding of Prince William and Kate Middleton has to be The Bad Witch's Festival of the Week. Many pagans are royalists. They like all the history and tradition associated with having a Royal Family that you don't get with a president. And although The Royal Wedding might not be a pagan event, it is taking place very close to Beltane, which is the pagan festival of fertility. Many pagans honour the sacred marriage of the God and Goddess on the first of May, their union promising that the land will flourish and bring a bountiful harvest. Some pagans and Christians alike look to the Grail legend and the concept that the health of the land is mystically connected to that of its King. And Prince William is in direct line of succession to the throne, after his father Charles, Prince of Wales. Even if you don't buy in to those folk tales, the Royal Wedding is at least something to cheer us all up during these dark days of economic uncertainty. But, however wonderful the ceremony looks, I won't be calling Prince William and Kate Middleton's big day a fairytale wedding. I'm sure there will be all the pomp and spectacle that one would expect for such a momentous occasion and the couple will look gorgeous in their finery. For me, there was only one fairytale Royal Wedding - that of Prince Charles and Lady Diana. I watched it when I was young - young enough to believe that real life can be a fairy tale. But it isn't, and the story of Charles and Diana's marriage certainly had no fairytale ending. Nevertheless, if a Bad Witch can make a wedding day wish for Will and Kate it is this - that they can, and will, live happily ever after. 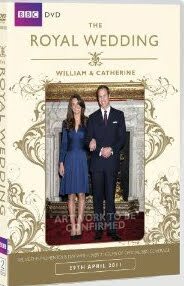 The picture shows the BBC DVD of The Royal Wedding - William and Catherine , which is available to order through Amazon. Simon, Thanks for mentioning those trees! That will be interesting to watch.